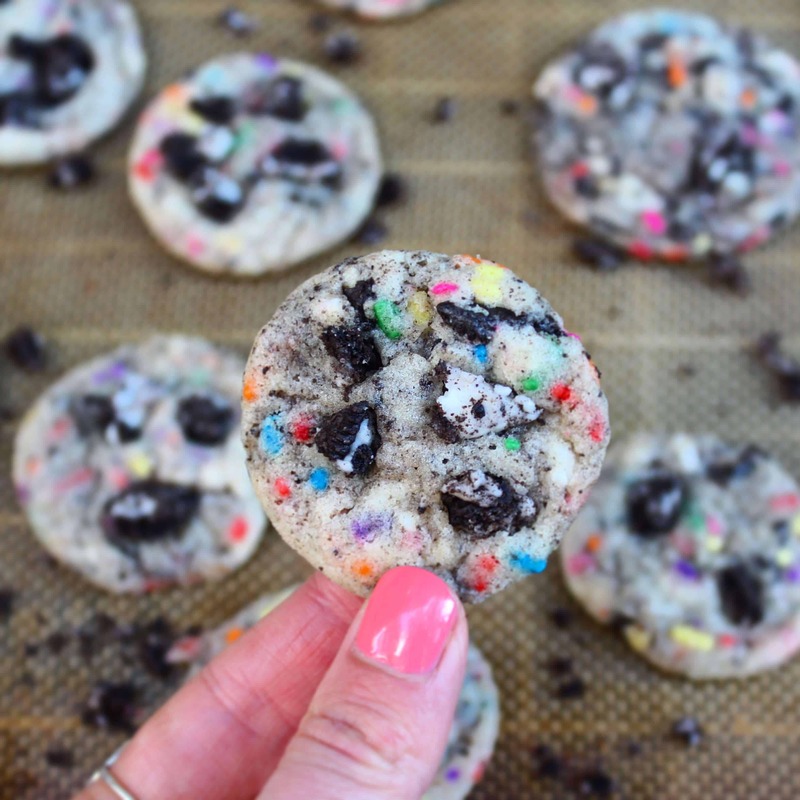 You can never go wrong with cookie on cookie action, and the crushed birthday cake Oreos and sprinkles in these cookies really take them to the next level. The secret to keeping them soft and chewy is a touch of cream of tartar. Sounds strange, but trust me on this one. In a large bowl, cream the softened butter for about 1 minute on medium speed. Add the sugar on medium speed until fluffy. Mix in egg and vanilla, scraping down the sides of as needed. Add in the salt, baking powder, baking soda, and cream of tartar. Mix until just incorporated. With the mixer running on low speed, slowly add the flour to the butter mixture 3 different parts. The dough will be quite thick. Lastly, add in 1/2 of the sprinkles above (reserving the rest for later), and the crushed oreos. 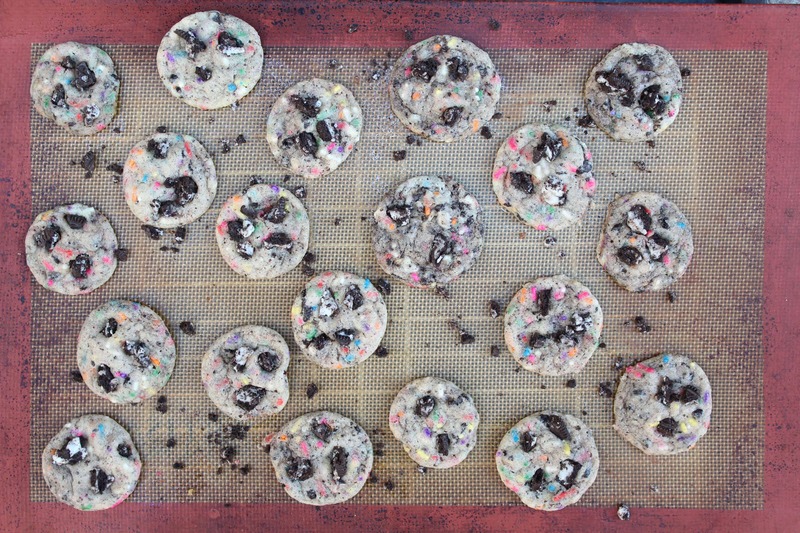 Mix on low until the sprinkles/oreos are evenly distributed throughout the dough. Scoop and roll about 3/4 inch cookie dough balls. Chill the balls of dough on lined cookie sheet for at least 2 hours ( I use silicon baking mats, but parchment would work fine too). This helps keep the cookies chewy, as it prevents them from spreading too much while baking! Preheat oven to 350F. Bake the chilled cookie dough for about 7 minutes. The cookies will appear undone and soft, but will continue to bake and firm up while they cool on the baking sheet. I pressed a few pieces of crushed oreos onto the top to these cookies once they’d been out of the oven a few minutes. Allow the cookies to cool on the cookie sheets for 5 minutes, then move them to wire rack to cool completely. About how many cookies does this make? Thanks! Hi! Would this dough freeze well if I wanted to save half to bake at a later time? Thanks!